I hope you had a fabulous and restful summer with your children. 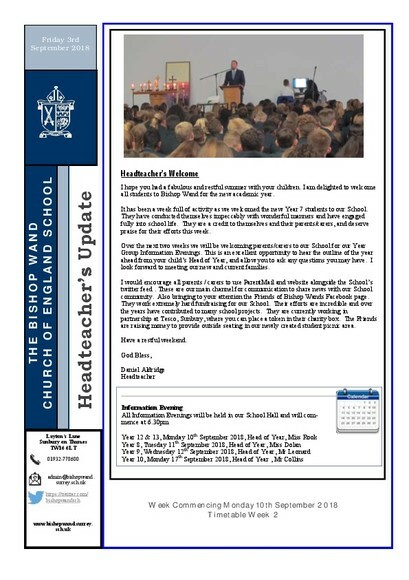 I am delighted to welcome all students to Bishop Wand for the new academic year. It has been a week full of activity as we welcomed the new Year 7 students to our School. They have conducted themselves impeccably with wonderful manners and have engaged fully into school life. They are a credit to themselves and their parents/carers, and deserve praise for their efforts this week. Over the next two weeks we will be welcoming parents/carers to our School for our Year Group Information Evenings. This is an excellent opportunity to hear the outline of the year ahead from your child’s Head of Year, and allow you to ask any questions you may have. I look forward to meeting our new and current families. I would encourage all parents / carers to use ParentMail and website alongside the School’s twitter feed . These are our main channel for communication to share news with our School community. Also bringing to your attention the Friends of Bishop Wands Facebook page. They work extremely hard fundraising for our School. Their efforts are incredible and over the years have contributed to many school projects. They are currently working in partnership at Tesco, Sunbury, where you can place a token in their charity box. The Friends are raising money to provide outside seating in our newly created student picnic area.